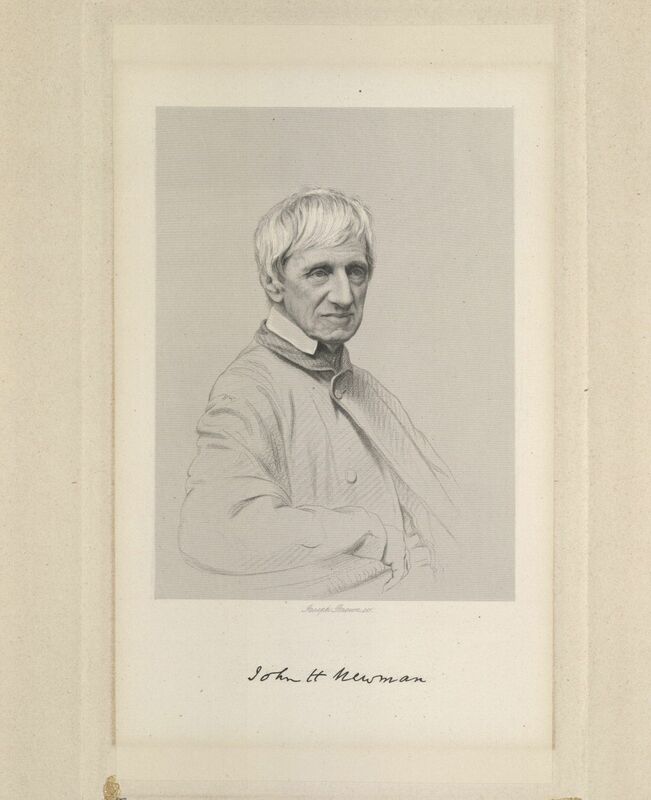 Today we mark the feast of the Blessed John Henry Newman – one of the spiritual and intellectual giants of the Church. His life spanned almost the whole of the noneteenth century. He was born in the middle of the Napoleonic Wars and died only a quarter of a century before the Great War. He came to Christ as a schoolboy, and the rest of his life was a pilgrimage to know and love him more. A Calvinist at first, Newman came by degrees to understand something so many still fail to grasp, which is that Christianity has a history. Yes, we are born again into a new life, but that life is in the context of the church founded by Christ. The more Newman delved into history, the less certain he became that the church he was born into was that churc. It certainly claimed to be part of it, and for half his life, Newman held to that view. In order to explain how that could be so when it was not in communion with the Bishop of Rome, Newman sought to find support from history; what he found was that history knocked that argument to pieces. St Peter was the prince of the Apostles. Ancient writers distinguished leadership by looking at how many times a person was mentioned, and Peter scored highly – quite apart from the fact that Jesus asked him to ‘feed my sheep’ and changed his name from Simon to Rock. The Western Church had always beenin communion with Rome, and now the church he was in was not. So, Newman found ways of explaining this. The Anglican 39 Articles could be read in a ‘Catholic’ sense, and one could find unity in the ancient creeds, avoiding the ‘accretions’ the Romans had added. The problem was that the more he delved into history the clearer it became that the so-called ‘accretions’ were simply developments of what had always been there. Take, for example, veneration of the Virgin Mary. As far back as history would go, men had indeed called her ‘Blessed’ even as Scripture said they would. Men and women loved her for her love of her son and for her care and her sacrifices – parents could identify with her, and mothers above all. Simple people simply loved her, and they did what people do when they love someone – they made pictures of her, they made prayers to her. 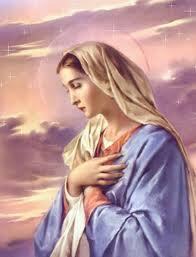 Unlike every other saint associated with Jesus, she and she alone had no runoured burial place. The people loved her, the Church noted that, as it noted that she was the second Eve, and if she was that, and if Jesus was sinless, she too, must have been sinless, and if sinless, how could she have suffered the penalty of Adam? Out of these simple observations and devotions came Marian veneration and doctrines such as the Immaculate Conception. These things grew in the Church – how was that? Newman came to see that the real question was the opposite one – if the Church was moved by the Spirit, how could it not grow and come to a greater understanding of the ‘faith once received’? Since the Catholic Church in communion with Rome showed all these signs of life, then, Newman came to see, it was where he needed to be – and he joined it. His life in his new Church was not easy. Converts are not always welcome, and when they are, they are expected to be as conservatively Catholic as possible. Newman continued to write and think with the inspiration of the Spirit, and that did not pleases many in a Church which felt itself under seige and thought the only way to go was to put up the barricades and find a few last ditches in which to die. But Newman persevered, and was finally rewarded with a Cardinal’s hat. Five years ago he was beatified by one of his greatest admirers – the most theologically brilliant Pope since the Middle Ages, Benedict XVI. For most of his life Newman was a simple parish priest ministering to the poor. Through him God gave us much we needed – and still need. REVEALED truth, to be what it professes, must have an uninterrupted descent from the Apostles; its teachers must be unanimous, and persistent in their unanimity; and it must bear no human master’s name as its designation. On the other hand, first novelty, next discordance, vacillation, change, thirdly sectarianism, are consequences and tokens of religious error. These tests stand to reason; for what is over and above nature must come from divine revelation; and, if so, it must descend from the very date when it was revealed, else it is but matter of opinion; and opinions vary, and have no warrant of permanence, but depend upon the relative ability and success of individual teachers, one with another, from whom they take their names. It is the claim of the Church that it has done this faithfully. It has sought to deepen the understanding of the ‘faith once given’, but never to change it. It is the servant of the Truth, not its master. So, however many the arguments given in favour of having women as priests, or approving active homosexuality (as long as the partners are faithful), it finds its hand bound: this is not what the Apostles said; these thing would be novelties; they would be changes. They are, by that, tokens of error. Just as it would have been easier to have had a single version of the Gospels with the seeming inconsistencies ironed out, or to have a version of the doctrine of the Trinity which made complete sense, so now, as then, the Church is bound by the Apostolic tradition. The Apostles did not teach thus, it cannot teach thus. Though it would win the applause of princes, it cannot bend to do it, just as it cannot do so to win the plaudits of public opinion. That does not mean the Church ossifies. Not one Apostle ever recited the Creed, St Peter was married, and once many priests were. Once, what we call the Mass was celebrated in Greek (as it still in in some churches), and it has had many forms. Once there was not even a New Testament, just Apostolic books received by the Church because tradition said that is what they were. But precisely because the Church cannot change what is immutable, we know that what we call the New Testament is what we claim it to be; there is no other way. So the fidelity of the Church is to the teaching of the Apostles, and we have their successors who are authorised to say whether such and such a thing is in accord with the Apostolic deposit. At the beginning and the end of the day, we either, as Catholics, believe that, or we abandon the firm ground and go who knows where? Over on the Newmanlectures website, we have been exploring the English Catholic tradition. The Reformation was a national trauma, but it did not erase the Catholic Church in England; and there are those of us who would contend that Catholicism was not confined to those Catholics who continued to own allegiance to the Pope. I choose that form of words with care. I am not asserting there was more than one Catholic Church, but I am suggesting that the Catholic tradition was not confined to one place. There were always bishops and priests in the Church of England who believed that Christ was really present in the Eucharist, and who held all the the Church had always held – the one exception being the position of the Bishop of Rome. In this sense, the position of the Anglican Church was rather similar to those of the Orthodox Churches of the East. Reference to what the Ancient Church had held was their rule, rather than reference to the Reformers. When it came to considering the doctrines of salvation, it was to the Creeds and the sacraments, not simply ‘faith by justification’ to which these Anglicans looked; repeantance and confession remained part of their pattern of faith; the sacrmanets were not merely symbols in the sense of not meaning anything beyond what they appeared to be, they were part of life in Christ, and they conferred Grace. They saw their Church as part of the universal Church, but, like the Eastern Churches, a branch and not a separated Church. That, of course, was not the view from Rome. But there is a difference between ecclesiology and spiritual life, and in terms of their spiritual life, men such as Lancelot Andrewes (1555-1626), George Herbert (1593-1633), like Keble, Newman and Pusey were always thoroughly Catholic, even though of that goodly number, only Newman felt the need to cross the Tiber. That Catholic tradition continued into modern times, with men such as Charles Gore and Michael Ramsey. It was the one which nurtured me as a young man, and indeed, into adulthood. For many of us, the decision by the Church of England to ordain women as priests was the occasion, if not the cause, for us crossing the Tiber. I say that because in many ways it was not so much the straw which broke the camel’s back, more the outward and visible sign of an inward determination to pursue a vision of a Church which would adapt to the times even on matters where it would widen the divide with our Orthodox and Roman brethren. In 2011, Pope Benedict XVI announced the creation of the Ordinariate of Our Lady of Walsingham which made pastoral provision for Catholic Anglicans to cross the Tiber together, and in a way that allowed them to retain their Anglo-Catholic patrimony. It was one of many signs of what a great Pope he was. The Ordinariate recently launched an initiative, ‘Called to be holy‘ which emphasises that heritage and shares it with the rest of the Christian world. 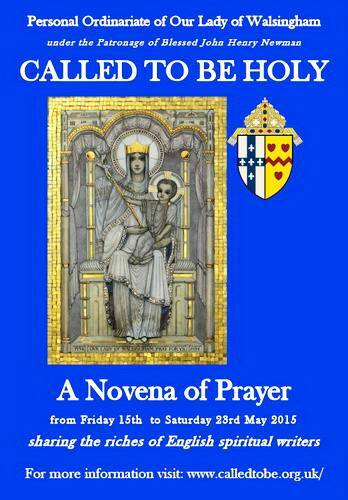 The Novena is one I have taken to praying, and found to be most beneficial. ‘My God, my God, why hast thou forsaken me?’ Those standing by thought, we are told, that Jesus was crying for Elijah. As so often they misunderstood. Jesus was quoting Psalm 22, fulfilling the prophecy of the ‘suffering servant’ in Isaiah. They had all looked for a King; they found one whose mercy and goodness they could not fathom, one who became sin to redeem their sin. Their response was to betray him in different ways. Of the betrayal by Judas, Jessica has written movingly here and here, bringing out the way in which he is the dark side which lurks in us all, that part of us which, if it is indulged, will grow through the work of satan until we are consumed by it; those cannot relate to that have my envy. But there are other betrayals that night in Gethsemane. Not one of those who said they would stand with him was able to remain with him in prayer for even an hour; even when they were given more chances, they failed him. He knew it would be so, even as he knew that Peter’s flesh would be much weaker than his spirit. At the last he stood alone before the Sanhedrin and before Pilate. It was not until he was in his final agony on the Cross that there were any familiar and friendly faces, and it is notable that most of those are women; of the Apostles, only St John was there. Big and brave were the words of the men, small and cowardly were their actions. But before we sit in judgment, are we much better? Do we confess Him with our lips and yet not in our lives? How do we confess Him there? f you ask me what you are to do in order to be perfect, I say, first—Do not lie in bed beyond the due time of rising; give your first thoughts to God; make a good visit to the Blessed Sacrament; say the Angelus devoutly; eat and drink to God’s glory; say the Rosary well; be recollected; keep out bad thoughts; make your evening meditation well; examine yourself daily; go to bed in good time, and you are already perfect. As we task ourselves with devotional tasks which may be beyond us, and which may lead us to betray Christ, let us take refuge in these thoughts of Newman’s. If we follow that advice, we shall make a better fist of it than if we aim too high. Implicit in the argument outlined in yesterday’s post is that Christian spirituality helped create and animate our ‘Western’ culture, and that the decline in its influence has had an enervating effect on that culture. If any of that is even close to being right, then it raises a serious question which Christians need to address: what went wrong? The temptation – and I fear that like easy temptations, it has been fallen for – is to adopt a version of the old German ‘stab in the back’ theory. So, whether it is the ‘Spirit of Vatican II’ crowd, or the ‘liberals’ in the Church of England, or the ‘modernisers’, it is always some group of ‘others’ who have inflicted wounds on Christianity. If I suggest this is not so, I do so not in the sense of suggesting that such groups and the forces driving them played no part, but rather in the sense of saying that this misses the lessons we need to learn by blaming a scapegoat. If, as is implicit in the ‘stab in the back’ line, the Church (be it Anglican, Roman Catholic or whatever) was in such high vigorous form, why did it concede ground so easily to minority groups? Indeed one might go further and ask where such groups came from and how, in a flourishing and healthy Church, they came to occupy positions of power? Here, the suggestion is offered that things were not quite as healthy and vigorous as they looked, and that the seeds of what happened were already not only planted, but growing rather vigorously. One of the problems with making dissent dangerous in a Church is that it does not go away, it goes underground, and it goes somewhere else – into the process of educating seminarians. 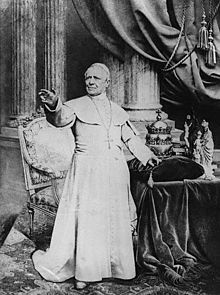 Thus, the various ‘errors’ condemned by Pius IX – and remember, he was only drawing together previous condemnations, not enunciating any new thoughts in 1864 – were already present in the intellectual life of the West, and ideas cannot be revoked or unthought. This is what the Blessed John Henry Newman meant when, in response to Pusey in 1865, he argued in favour of full and free debate in the Church; bad ideas, he believed, were best driven out by better ones; suppressing them would simply drive them underground, and who could tell where they would pop up? Newman was correct, and the Blessed Pius IX was wrong, even his if instincts were sound. Yes, the ideas were, as Newman acknowledged, potentially threatening to orthodox Christianity, but by closing down discussion, what Pius and his successors did was not to drive them out of the Church, it was to render challenging them impossible because even those like Newman, who would have done that, risked being themselves denounced by the heresy-hunters such an attitude encouraged. As a Patristics scholar and historian, Newman knew that the Church had not proceeded well when it had sought, in the past, to close down discussion. By the Grace of God, Athanasius had escaped, at times miraculously, from the enemies who sought to silence him in the name of the compromise they wanted with the Arians. Such a compromise could have been had at almost anytime, which was one reason his enemies wanted Athanasius out of the way, as they saw him (and rightly) as the main obstacle. But he sought refuge from the Bishop of Rome, and was able to carry on the argument for orthodoxy which, despite the huge weight on the other side, prevailed. It would, Newman believed, have always prevailed, as it always does in the end, but it would have been a longer and more hazardous process if Athanasius had been silenced by the episcopal consensus of the post-Nicene decades. Blessed Pius and his successors succeeded in silencing the dissenters, but at a price. Driven underground, the ideas appeared in educational materials and flourished in intellectual circles, and the response of the Church was not to do what Athanasius did, but, because unlike him it enjoyed power, to do what his enemies had done – shut down debate. So, the ideas continued to circulate, and did so with the kudos that some minds will always attach to something authority tries to silence. In the dark, with the odd Papal slap on the wrist, the ideas and their advocates flourished – with no intellectual counter-weight. Experience suggests this was not a wise policy. By the 1970s if the sky was dark, it was with the wings of chickens coming home to roost. The end of the calendar year is a useful prompt to reflection. On the parochial level of this blog, it has been a year which has seen huge changes: illness and then vocation, have pulled Jessica away, whilst circumstances have done the same with Geoffrey Sales, who for so long has been our mainstay here: this seems a suitable opportunity to thank both of them on our behalf – and I think and hope that with Geoffrey, there is a chance we shall see him here again. Then there was the blog going private, thanks to that strange modern liberal trait which appears to regard disagreement with its tenets as a cause of personal offence, which again, changed the dynamics. But AATW has survived and I am happy to continue its mission, which is to encourage dialogue between Christians of all denominations and none. This was why Jessica founded it, and it is in that spirit it will continue. One of the reasons Newman so favoured the free interplay of ideas, was that he was convinced that it was the only way in which orthodoxy could be established. Steeped as he was in the patristic sources, he was more aware than most of the dangers attending on attempts to suppress free discussion. His great hero, Athanasius, went into exile many times, and was saved only by the Grace of God, all because he insisted on the Nicene truths at a time when reasons of State had made them inconvenient to a majority of Bishops. Accused, many times, of heresy, had his opponents been able to lay their hand on him, they would have had him executed; when the boot was on the other foot, in his later and more settled years, Athanasius did not return evil for evil. Ideas, Newman knew, cannot be uninvented, and the attempt to suppress them makes martyrs, and martyrs make causes. Newman himself suffered in his own lifetime, both as an Anglican, and a Catholic, from the machinations of those in power who did not like what he had to say and sought to suppress it. Anglican bishops of a certain ilk did not like being reminded of the Catholic heritage of their Church, and how much of it could be rediscovered; Catholic bishops of almost every hue, did not like being told that the faithful were good for more than filling the pews and paying the bills; but Newman insisted on these things. By ‘insist’, I do not mean that he led a campaign (although as an Anglican he did help inspire a movement whose life continue long after his own conversion), but rather than he put his ideas forward insistently. Newman was a great polemicist, but one who believed that it was through the free interplay of ideas that truth could be found. He refused to believe that one side had the whole of the right on its side, even though, as a Catholic, he did believe that the fullness of the Faith was to be found there – even if some Bishops appeared so taken by the fashions of the day that they had forgotten their own history. Newman disliked persecution, not just because he was a victim of it, but because it got in the way of truth. Had Athanasius been executed, had the semi-Arians prevailed, then the world would indeed have been heretical. That did not happen, and Newman’s belief in the Holy Spirit was somewhat greater than that of those who applied so ardently to assist it by closing the mouths of those with whom they disagreed. He recognised the temptation to mistake one’s own views for those of the Spirit, not least in the Church founded upon the faith of Peter; Peter had been most fallible at times, how could his successors not be? The miracle was that despite their best efforts, Catholics had not destroyed the Church; Christ’s promise stood and would, Newman believed, stand until the ending of the age. He was not, as we have seen, and will see, blind to the dangers inherent in his idea of the developing understanding of doctrine, and indeed, provided tests to help us see what was genuine and what was not. But he knew the Church was the living Body of Christ, and all living things develop; if they do not, they are dead. The Church of Christ is not a museum piece, it exists for the saving of souls, and for that work, and it alone, was it founded and continues to exist. Newman’s claim to prefer ‘full liberty of thought’, is one which not all Catholics then, or now, would endorse. The Church used to have an index of prohibited books, and much good it did it. ideas, as the totalitarian states of the last century discovered, and their politically-correct successors in this one will discover, cannot be uninvented; thoughts cannot be unthought. Indeed, for all the ability of the early Church to pronounce heresy as such, the ideas expressed by the likes of Arius have never gone away; but the utility of the fact that his ideas were considered, and at length, is that there exists a repository of good arguments to show why the Church holds that Jesus id fully human and fully divine, and why the idea that he is just a God-inspired man will not work with the revelation God has given us. Yes, it is possible, and it has been done, to suppress your opponents, kill them, and outlaw their ideas; but what has never happened is that this has worked. There never was a State (up to then) more viciously opposed to Christianity than the Soviet Union, but not even seven decades of repression succeeded in extirpating the Faith. One of the weaknesses of the Communist system is that by repressing and suppressing opposition, it became stagnant and incapable of responding to the challenges it faced in the last twenty years of the existence of the old USSR. Much the same would happen if the Church were to behave in similar fashion. Newman was right to draw a distinction between customs and practices and doctrine; the former are cultural and relative; the latter are neither. So, to take one of our friend Bosco’s favourite topics, Marian veneration. It may well be that in some times and places and cultures there has been something of an excess in the language and imagery used by some to express their love for the mother of Christ. It seems pretty natural for someone from an Anglo-Saxon background to recoil a bit at a description of her as “Queen of Heaven’; but if anyone says she is more important to our salvation than her Son, then what begins as an excess of enthusiasm ends in heresy. But just as we might, rightly, suggest that less excess is less likely to lead us astray, we ought also to distinguish between practice and belief. And I would add that one need not be a scholar to recognize orthodoxy and heresy. Thanks be to God, there is something I like to call ‘a Catholic sense’ which is more of a moral and doctrinal compass that allows one to wander into foreign lands and still feel that one is not hopelessly lost. So, this Advent, let us strive even harder, to cultivate that ‘Catholic sense’. It is good, I think, and here I agree with Newman, that we strive to the uttermost to keep people in the Church and that we are slow to charge them with heresy; and it is good that there should be free and open discussion; but it is also needful to stress that there are things which the Church cannot change, because they are truths we have of God. It is its duty to instruct the faithful, leaving them the largest leeway possible with regard to how they practice their faith – but also the best instruction possible on the content of that faith. Perhaps, at times, it has, latterly, concentrated too much on the former and taken the latter too much for granted? 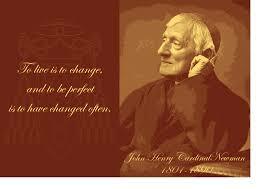 Today is the feast day of the Blessed John Henry Newman. The most famous convert to the Catholic Church in nineteenth century England, it is arguable that the Church never had any idea what to do with him and failed to use his gifts to its advantage at the time. But it did not matter. Newman was faithful to the Church, he accepted the difficulties which accompanied his choice, and he got on with the work given him by God. In the century after his death he became steadily more influential, and is now recognised as not only one of the greatest of English prose stylists, but one of the most influential Catholic writers of the last few centuries. His beatification on 19 September 2010 by the most intellectual Pope in centuries was a fitting culmination of his irresistible rise. 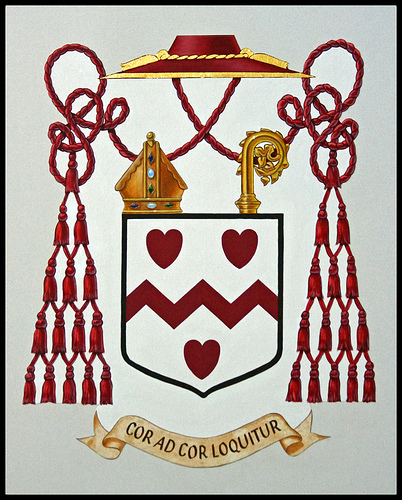 Though a formidable intellectual, Newman chose as his motto as a Cardinal the Latin phrase ‘cor ad cor loquitur’ – heart speaks to heart. In this extracts from a sermon from the 1830s, where he reflects on the nature of Christian love, we can perhaps grasp why he did so. Love, then, is the seed of holiness, and grows into all excellences, not indeed destroying their peculiarities, but making them what they are. A weed has stalk, leaves, and flowers; so has a sweet-smelling plant; because the latter is sweet-smelling, it does not cease to have stalk, leaves, and flowers; but they are all pleasant, because they come of it. In like manner, the soul which is quickened with the spirit of love has faith and hope, and a number of faculties and habits, some of which it might have without love, and some not; but any how, in that soul one and all exist in love, though distinct from it; as stalk, leaves, and flowers are as distinct and entire in one plant as in another, yet vary in their quality, according to the plant’s nature. The ‘if’ in that sentence cuts to the heart of the matter. Perhaps it can be worked backwards? The Creed defines orthodox belief; why do I accept that? It was not the work of any Pope, and it was not even the work of all the bishops; it was, though, agreed over two Councils of the Church and accepted by a consensus of the faithful. Newman wrote on that too, and he came under suspicion in an era when some thought that the only duty of the laity was to do as it was told and pay up; that was an unhealthy state of affairs. The last comment may well be the chief reason that the first part of this prophecy has not come to pass, but is no reason why it should not. Under St. Cyril of Alexandria, or St. Ambrose of Milan, the Church took the part of the people as against the restrictions of the secular power, and I think that the loss of the monasteries did harm to the common people of England. Too often we think that there must be a gulf between the idea of a Pope with Infallible authority and democracy. But the Pope is not infallible on everything. The Church speaks to us on matters upon which the Apostles could pronounce; I never heard tell they were scientists or economists. On these matters there is much room for discussion and dissent, and I doubt there can be one Christian position. Those who paint the Lord as a long-haired revolutionary are as entitled to their view as those who see Him as a radical individualist; what they aren’t entitled to do is to force that on the rest of us. It is not through answering such questions that we will come to salvation, but through simple faith. Truth is not a concept, it is a Person, the Risen Lord. He is to be encountered in the flesh and blood at the Eucharistic feast; there, we meet Him, and He meets us. It is enough, it is all. Those of you who followed the short series I did here on Newman might be interested in the Newman Lectures website which curates the last series and is intended to provide an ongoing resource for those interested in Newman. He is much in my mind at the moment, because, like us, he lived in a time when it seemed as though the State was hostile to the Church which was, itself, divided over how to respond to changing times. Those who wish to stop change are on a hiding to nothing. It is a constant, and the only real question to be asked is whether it is in accord with what has gone before, or whether it sweeps away what has gone before; the attempt to hold it back usually produces a flood in time which, as with the French and Russian revolutions, washes away everything which religious people hold dear. Newman and his Oxford friends wished to hold back the reforming programme of the Whig Government of the early 1830s; had they succeeded, then the results would have been far worse than they were. The Whigs were, at the end of the day, optimistic aristocrats who self-confidently believed that by taking hold of the levers of change, they could make it happen in a far less radical way than the demagogues wanted. So, to take the issue on which John Keble and Newman initially reacted with opposition, the disendowment of the Church of Ireland, here was a clear example of the State laying its hands on Church property. But who had endowed the Church in Ireland with so much property? The State had, in the hope that the Anglicans would be able to covert the Catholics in Ireland. This did not happen. The Anglicans were pretty idle at the business of conversion, the the Irish very attached to Catholicism. The result by the 1830s was that the Irish Church was grossly over-endowed. The Whigs did not want to give Ireland Home Rule, but they did want to removed an obvious abuse; so the disendowment was designed to achieve an appeasement of the situation in Ireland. It worked, at least for a while, and it was not until 1868 that Gladstone had to promise to disestablish the Anglican Church in Ireland. But the fact was that most of the Irish were Catholics and did not want to be united with England, and so by 1921 the English had to contrive a solution which allowed that majority to form their own State, whilst keeping the Protestant six counties as part of the UK. It was not a glorious episode in English history, but could have been a lot worse. Newman himself converted to Rome in 1845. He entered a Church which had been excluded from public life until 1829, and which was still regarded with grave suspicion by most Englishmen. The fact that there was an influx of about half a million Irish Catholics in the 1830s and 1840s did not make that Church any more palatable to the English. But Newman joined it because he had come to see it was the Church founded by Christ. It was, itself, a very divided entity. Within the English hierarchy there was a deference to Rome, and as Rome meant Pope Pius IX who was an unbending opponent of ever progressive trend of the century, the Catholic Church itself became identified with the blackest reaction; another nail in the coffin of its reputation in an England proud of being in the vanguard of progress and enlightenment. Newman was regarded with grave suspicion in Rome because although he was opposed to liberalism, he was not an unthinking opponent of it. 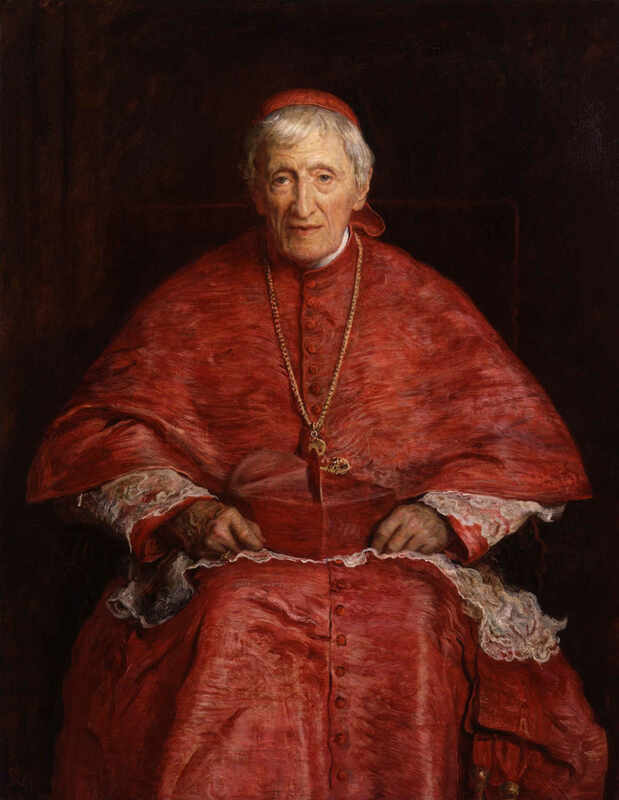 His fellow convert, Cardinal Manning, shared that suspicion, and it is clear that the Catholic Church never knew what to do with the genius of Newman. But Newman knew what to do with it. He was obedient to Rome, but insisted on continuing to think and to see how it was that Christ’s Church could continue to do what it was meant to do, which was to bring people to Christ. Manning’s name is now not quite forgotten, but his influence nugatory. Newman, by contrast, is a saint and one of the most powerful theological thinkers of the last two centuries. Manning swam with the currents of his time and as they ran dry, so did he. Newman attempted to think ahead of them, and did so.